Many investors put their cash in stocks and property, but Mr Ho Sou Ping is betting his bucks on art instead. Though it is not the works of Van Gogh or Picasso that have caught his eye. Mr Ho, 41, has a keen interest in collecting paintings of Singapore's pioneer artists and is also a painter in his own right. "Since 2011, the value of paintings by top local artists has appreciated by two-to four-fold," he explains. "Their prices had not moved much since the early 1990s, and it's high time these works received the recognition they deserve." He is a fan of the works of the late artists Chen Wen Hsi and Cheong Soo Pieng. "One of Mr Cheong's paintings can be found on the back of the $50 note we use today," he says. "It's a pity that not many Singaporeans know this." For Mr Ho, investing in art was a natural progression from his love of art. As a young boy, he enjoyed sketching and drawing and took up art classes when he was 13. At 16, he sold his first painting for $150 at an art exhibition in a community club. It was a Chinese painting with birds and flowers. Taking his mother's advice to hold a stable job, Mr Ho put his dreams of being an artist on hold. "Painting was something I did during my free time, both in school and after I started working," he says. Soon after, the responsibilities of being a husband and father took precedence and left Mr Ho with little time to paint. But as they became more financially secure, he and his wife agreed that he should have a shot at becoming a professional artist. The couple, who have two daughters aged nine and eight, attended several courses on managing money, which opened their eyes to concepts like taking risks and financial planning. In 2009, Mr Ho quit his full-time job as an aerospace engineer to sell his paintings at a gallery he rented. Two years later, however, the building he was in was sold to a real estate investment trust and the new landlord did not renew the lease. He then had to seek an alternative site. 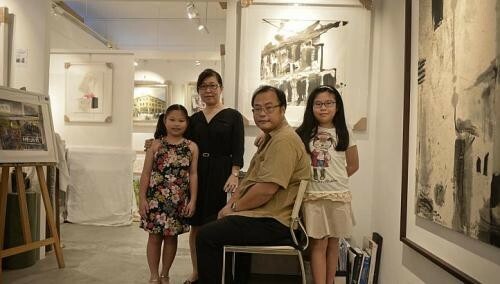 Mr Ho now runs a small art gallery - artcommune - at Bras Basah Complex. Rental, however, remains high, at about $6,000 a month for the 750 sq ft space. "I wasn't able to pay (the rent) just by selling my work - so I had to start trading art pieces and became an art dealer," he explains. Through buying and selling the work of other artists, Mr Ho managed to make a low six-figure sum last year. He continues to paint and sell his own work as well. A spender. Prior to 2009, I never had more than $1,000 in my bank account. I'd allocate about $300 from my pay as my allowance, pay the bills and spend the rest on my passion: art and related materials. About $1,000 on two credit cards which goes to expenses such as petrol, bills and groceries. My family drew up a monthly expenditure and income guide two years ago to help keep track of our spending. I take out health insurance policies for the family, which I strike off as expenses annually. Separately, I have term and life insurance policies as it gives my family an income stream if I'm gone. Most of my portfolio is in art. What started out as a hobby - buying art works I liked - also equipped me with the skills to know which pieces will go up in value. I'm hoping that the art works I collect can be used to pay for my daughters' tertiary education if they choose to study abroad. My father died when I was seven, so my mum single-handedly raised me through giving Chinese tuition. She always reminded me to be frugal, so my largest expenses were on food and books. Though my mum was the sole breadwinner, she set aside extra cash for me to pursue my interest in art. She paid for the art classes I started going for when I was 13. It was through my art teacher then that I got to learn more about different art forms, styles and be introduced to other artists. Some time in 2006, my wife bought a CD with learning points from success coach Anthony Robbins. We went on to attend other courses on topics such as "Money and you" and "Millionaire Mind Intensive" which showed us the importance of sound financial planning and investing early. In one of the courses, we were taught that if you work for someone else, you will never be rich. And how many aren't prepared to strike out on their own because of their unwillingness to take risks. About four years ago, my wife and I agreed that I would quit my job and focus on being an artist. I gave myself two years to make this career work, and have stuck to it since. An HDB executive flat in Sengkang which I bought with my mum in 1997. The 1,410 sq ft unit cost us about $420,000. I don't spend much on things. So it would probably have to be a 12-day tour to the United Kingdom last month which cost about $12,000. I intend to continue being an artist and sell my works. Being an artist is a special job because you never retire. It will keep me active, and allow me to spend time with my family. A 1,400 sq ft three-bedder condo in Hougang (owned by Mr Ho's wife), where I live with my mother, wife and two daughters. A nine-year-old Berlingo van which I got in 2006 and use for deliveries.